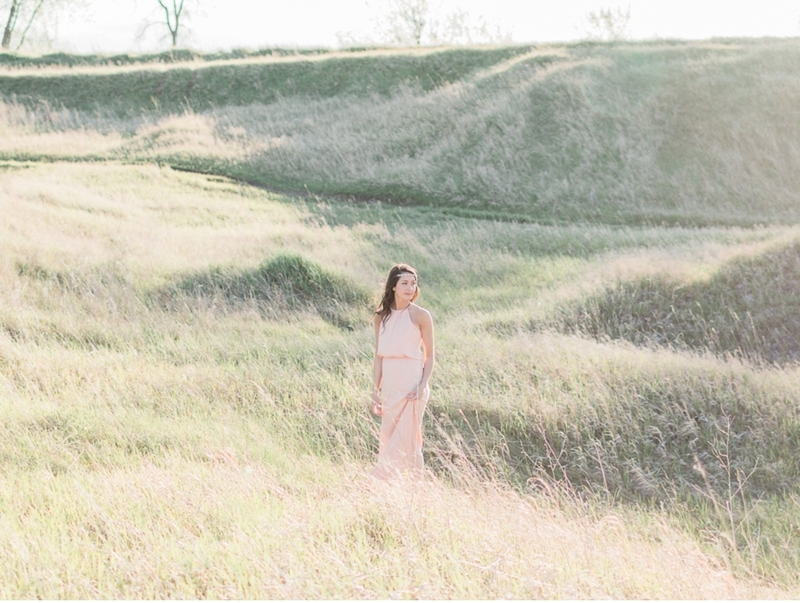 This look created and photographed by Esther Funk Photography quietly compliments the natural hues that dusk on the Canadian prairies creates. Perfect for an engagement session, elopement, or bridesmaid, the simple accessories and flowing pale pink gown photograph well under a big, breezy sky and amid the soft rustle of prairie grass. A bouquet of foraged white lilacs brings a sense of heritage along with an aroma that evokes memories of sultry summer evenings. Wavy tresses mimic the sweet waving grasses and bare feet sunning on a warm rock complete the carefree, romantic ensemble. I'm going to say it's the perfect way to kick off the month of June on Vale + Vine. For more summer wedding inspiration, take a peek at this Waterton Lakes Anniversary session by Marcie Meredith or this lavender farm shoot by Cory Weber.